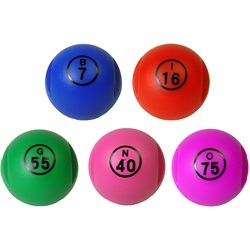 This Bingo Ball kit comes with, 100 metallic chips, a magnetic top, and the bottom holds all 100 metallic chips. Easy way to place your chips, with a quick method of clean-up, just wave the magnet over the chips and see them jump! Now with a convenient Bingo ball carry case.